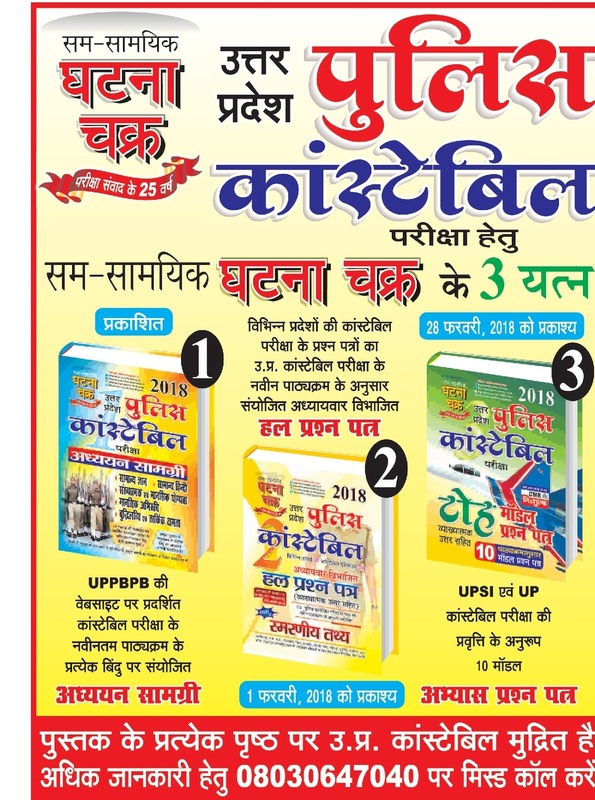 UP Police Constable Study Material 2018 Check Exam Preparation with Guide Books & Samsamayik Ghatna chakra to succeed in written exam of 41,520 constable. UP Police Constable Study Material 2018 standard will be previous year 2014 Question paper based on Senior Secondary School 10th and 12th pass. Guide Books if you prepare a up board model papers of math’s of high school, current affairs of arihant & English should be read from lucent then it is suitable. After that lists of qualified candidates drawn up in order of Merit list on the basis of the performance in the written and computer tests shall be equal to the number of vacancy advertised. Educational Qualification- Candidates should pass 12th Intermediate class passed from any recognized board. Sam Samayik Ghatna Chakra we have some latest name article taken from top news paper of Uttar Pradesh.